Producing the Poppy; A tour of Lady Haig’s Poppy Factory. 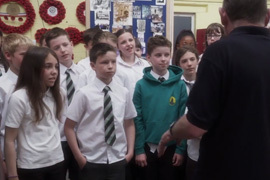 A short film which follows a Primary 7 class as they tour Lady Haig’s Poppy Factory in Edinburgh, meeting some of the disabled ex-servicemen who hand-make the poppies and wreaths for the Scottish Poppy Appeal. 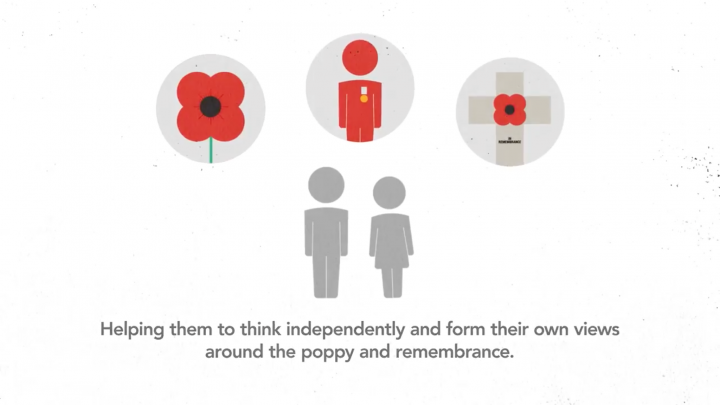 A short film to introduce Sowing the Poppy seed: Poppyscotland Learning. The Poppy Story (Early Years). An animated short film about the journey of the poppy and what it means. Written specifically for very young children this is an excellent introduction to the poppy and remembrance. Updated for 2013. The Poppy Story (First Level & up). An animated short film about the journey of the poppy. An excellent introduction to the poppy, remembrance, veterans and Poppyscotland. Updated for 2013. Don’t miss the latest episode of telly’s top talk show ‘A chat with…’ where showbiz interviewer Mr Brad Bradley gets up close and personal with superstar icon of remembrance Miss Poppy Scotland. All you ever wanted to know about Poppy will be revealed! An ideal introduction to Poppyscotland for younger children. This film is a scrap-book of six pupils’ photographs, memories and observations from a trip to the First World War battlefields of France and Belgium. A mix of fact and opinion, the piece is a good starting point for debate about the First World War and conflict in general. First World War soldiers bound for camp arrive at Campbeltown. Soldiers bound for camp arriving at Campbeltown, together with their supplies in horse-drawn carts and wagons. A compilation of footage from the First Gulf War. Second World War Home Guard on manoeuvres. Home Guard on parade in barracks yard and then on manoeuvres. St Brigid’s Primary School – James Stokes – A Gorbals Hero. Internees return to Leith after the end of the First World War. Taken at Leith in 1918, the ‘Return to Leith’ film shows the arrival by ship of internees returning from Europe, with the request ‘watch the picture carefully, and see if you can identify anyone’. Kemnay Academy – Remembering in Kemnay. One of the finalists from Moving Stories 2012 – our short film education competition. A documentary which cleverly relates remembrance in a village in Aberdeenshire to the idea of global remembrance using interviews and local stories. Dunoon Grammar School – A Portrait of Walter. Kinlochbervie High School – Voices from War. One of the finalists from Moving Stories 2012 – our short film education competition. Based on an original script created by Kinlochbervie High School the film uses characters from different periods of time to voice each line of the script with dramatic effect. Footage of The Falklands War including recaptured South Georgia, prisoners, casualties and conflict aftermath. Knightswood Primary School – 90 Years of the Poppy. One of the finalists from Moving Stories 2011 – our short film education competition. This charming short film uses period reconstruction, a thoughtful voice over, and poetry to perfectly encapsulate more than ninety years of the Poppy Appeal in Scotland. Dumbarton prepares for impending war as shown by media. Dumbarton prepares for impending war as shown by media. Air raid warning posters are shown. The Falklands War Task Force: Preparation, departure and life on board. Footage of Falklands Task Force including preparation, departure and all aspects of life on board. Douglas Scott, Historian, 1930-2010, on the debate about his grandfather, Field Marshal Sir Douglas Haig. Military Historian, Douglas Scott (1930-2010), on the debate about his grandfather, Field Marshal Sir Douglas Haig. Mickey Mouse cartoon excerpt – ‘Mickey Enlists’. Mickey Mouse cartoon – ‘Mickey Enlists’. VE Day celebrations in Dumbarton. Footage of the Black Watch at camp and on exercises. Includes colour footage of tank manoeuvres. All Saints Secondary School – For Our Tomorrow. Aberchirder Royal British Legion Scotland parade. Parade of war veterans and youth organisations to dedicate the war memorial at Aberchirder. A word from the Earl Haig, 1918-2009. Earl Haig (1918-2009) talks about his own experiences of war, The Earl Haig Fund and recent conflicts. Early footage shot in Lady Haig’s Poppy Factory. Earl Haig: Brilliant or Butcher Debate for Second & Third Level. Using the resources contained within this challenge write a speech (For & Against) for an upcoming debate on the founder of Poppyscotland: Earl Haig. Teacher’s notes and student’s notes contained within the one challenge document. The Scottish Poppy Appeal (Jack Alexander, 2011). Jack Alexander, author of McCrae’s Battalion, provides a comprehensive history of Poppyscotland. PowerPoint presentation which can be used at a remembrance assembly in schools or colleges. This presentation outlines the effect of the First World War on the nation. Assembly explaining the significance of the centenaries of the First World War. This is the first of two linked PowerPoint presentations with the same title. If you are downloading this PowerPoint we recommend that you also look to download ‘Remembrance and centenaries of the First World War (Day Two)’. Remembrance Assembly Challenge. Learners are challenged to plan and lead a whole school assembly sharing their own songs, poems, and art work, with an invited guest from Poppyscotland, or a local veteran etc. Teacher’s notes and students’ notes are combined into one document which is easy to download as a Word or PDF file. Garden of Remembrance Challenge. Learners are challenged to design and create a memorial/garden of remembrance, organising a special event for members of the community, including those affected by conflicts. Teacher’s notes and students’ notes are combined into one easy to download document which is available as a Word or PDF file. Scottish Poppy Appeal Challenge. Learners are challenged to organise a Scottish Poppy Appeal fundraising event in their school and develop enterprise skills. Teacher’s notes and students’ notes are combined into one easy to download document which is available as a Word or PDF file. First World War Timeline Challenge. Your challenge is to create a timeline showing what caused The First World War and how it unfolded. A number of different activities are also suggested through the use of support materials. Teacher’s notes & student’s notes are contained within the one document. Scottish Victoria Cross Research Challenge. Learners are challenged to find and research Scots who were awarded the Victoria Cross. Teacher’s notes and students’ notes are combined into one easy to download document which is available as a Word or PDF file. Exploring Local Places of Remembrance Challenge. Learners are challenged to explore and re-create aspects of local places and memorials of remembrance. Teacher’s notes and students’ notes are combined into one easy to download document which is available as a Word or PDF file. PowerPoint presentation about remembrance and Armistice which could be shown at a school assembly. This presentation explains through the use of photos and short sections of text the history of Armistice Day. PowerPoint assembly presentation outlining the importance of why remembering past conflicts is important. Download our Poppyscotland’s Schools Fundraising Leaflet and discover fun and enterprising ways in which you can raise money for the Poppy Appeal in the run up to Remembrance Day. The Falklands War Documentary Challenge. Learners are challenged to make a documentary (using digital resources) about The Falklands War. Teacher’s notes & Students’ notes are contained within the one exciting challenge document. Conflicts Since The Second World War Challenge. Learners are challenged to find out about recent conflicts in which British troops have been involved. Teacher’s notes and students’ notes are combined into one easy to download document which is available as a Word or PDF file. The Falklands War Timeline Challenge. Your challenge is to make a timeline showing what caused The Falklands War and how it unfolded. Teacher’s and student’s notes are contained within one document. Assembly PowerPoint presentation highlighting the role of poetry in remembrance. Poppy Product Challenge. Learners are challenged to design new products for Poppyscotland such as jewellery, wrapping paper, T-shirts, cards, event posters, bookmarks, calendars (showing local people and places) etc. Teacher’s notes and students’ notes are combined into one document for ease of access and download. Available in Word or PDF versions.